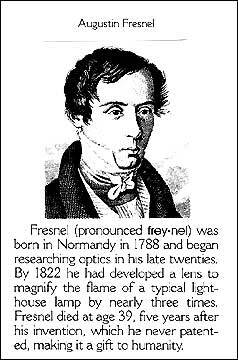 FRESNEL'S TOWER pays homage to the 19th French physicist Augustin Fresnel who overcame early learning disabilities to develop the complex lens for lighthouses given his name. 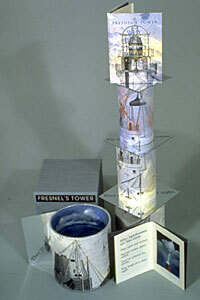 Designed as a sculptural book which allows the viewer to assemble their own lighthouse, it includes a hand colored photogravure. 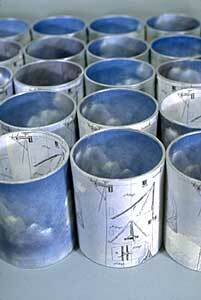 Board cylinders are wrapped with handpainted paper printed with the reproductions of an 18th century lighthouse. 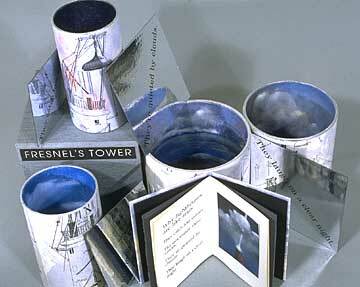 Inside each cylinder is a reproduction of a monotype of clouds. It was published as a limited edition of 38 copies. Out of Print.